On the southwestern edge of the Wiltshire Downs in England, in the valley of the River Kennet, lies the ancient market town of Marlborough. The center of this town is a picture-postcard place lined with lovingly-restored buildings ranged along either side of the second widest High Street in Britain. At one end of this High Street is the Victorian Town Hall and a few narrow lanes behind it, the Green. Facing the Green is a line of high, thin homes leaning one up against the other gazing out upon an alley of pollarded trees and the main road to Swindon that marks the end of the oldest section of the town. I have slept many times in one of these houses. I have slept in it heavily after coming back from an evening at The Lamb or the Italian restaurant on the corner. I have slept in it fitfully with my body still on New York time. Most recently, I slept in it with an upset stomach after a bumpy descent through the turbulence of an English summer thunderstorm. The present owner of this house is the widow of an architect whose name is the last on the list you can read if you should step into her ancient front porch. It is a list of the owners of the house dating back to the 1500’s and includes, in addition to her husband, the architect, who left us a few years ago to build castles in the sky, the name of the father of a Nobel Prize winner in Literature. If you are an American of a certain age, you know this name, even if you are not a follower of Nobel Prize winners. It was on the cover of one of those books you had to read in high school, a book you may or may not have liked, but which you certainly remember. The name is Golding. Ah, yes, you say and nod. I do remember. Lord of the Flies. Marlborough prides itself on being a very cultured town and has for years boasted a well-known jazz festival and now a literary one as well. We arrived this summer just after the Literary Festival had concluded and of course, William Golding is one of its patron saints. He grew up in Marlborough, you see, in this house on the Green, and went to Marlborough College where his father was the science master. Later, he taught there as well for a time until his books began to earn for him more than teaching ever could. As part of the literary festival, our friend had hosted a party in her home and she recounted an amusing story for us. At the conclusion of the evening, one of the guests somewhat the worse for drink announced that he had no idea who this Golding fellow was, but that he’d had a smashing good time at the party. We laughed together over this story, but when I thought about it later sitting upstairs watching the pigeons on the church cross next door, I had to ask myself if I was really any better. For if I had not been forced to read Lord of the Flies, I probably wouldn’t have known anything about Golding either. I, who prided myself on being well-read, had in the years since high school never once opened any of his other books. As of this writing, I am several books down the long list of works William Golding produced. I now know Golding often wrote about how groups of people persecuted weaker, “different” individuals. Many years after Lord of the Flies, Golding wrote an adult version of this first novel called Rites of Passage. In this work, a socially-clumsy, over-earnest parson is targeted by the crew and shunned by the passengers of a British ship bound for Australia. Although the persecution in this book is more social and psychological than in Lord of the Flies, it does eventually cross the line into the physical. The victim is not killed by a group of savage sailors driving him before them through the ship, but he is driven by shame and humiliation to destroy himself. At some point it became clear to me that I had to reread Lord of the Flies as well and I have to say that I found this a very strange experience. It was curious to me what I did remember of it: the near-sighted boy Piggy and his glasses, the conch the boys held to speak in their beachside assembly. I did not remember the imaginary beast that so terrifies all the boys (which is revealed to be none other than themselves). I did not remember the deaths: the little boy with the birth mark who is consumed by the jungle blaze, the epileptic Simon who is beaten to death by a mob of mud-smeared boys, and Piggy, poor Piggy, who is flung to his death amongst the rocks on the beach. Is it to my credit that I forgot these things? Is it to my credit that I only remembered the victim and the symbol of civilization, the conch? What I also found upon this second reading nearly thirty-five years after the first, was that I understood things now that I had not then. What was now clear to me (after having lived and studied in England) was that Golding’s stranded boys were the pampered, public school-educated offspring of the upholders of Empire. Only Piggy was not. He was a poor, clever boy who knew more than the other boys because he had to. Golding never says this outright. You know it by how Piggy speaks. I recognize that now, but when I read it in high school, I thought the boys didn’t like Piggy only because he was fat. 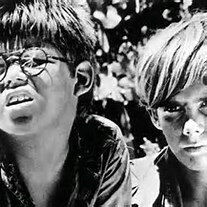 Is Lord of the Flies still required reading? Does it demand a product-warning on its cover these days? The story, after all, is strong stuff. It sees one child burnt to death, two brutally murdered, a third nearly so, all by a group of young boys. The book’s message, that without rules (and the people who stick to them) children, indeed anyone, will descend into chaos and savagery, is, though the book was first published in 1955, still a timely one. One wonders if they’ve read it in Sayreville, New Jersey? One wonders how the boys on the football team that is now defunct could have been left as alone in that locker room as if they had been marooned on a Pacific island. Where were the adults and the rules that adults carry with them? Where was the whistle, the clap of hands, the admonishing tone? Instead, the football players of Sayreville, pumped wild with victory, were left to their own devices, left to descend into savagery, until one of the victims, who didn’t want to be a Simon or a Piggy, went home and told his mum. You could say, I suppose, that Golding was an anti-bullying writer. You could say he was a pessimist. Or you could say that he did what all good writers do, he told a cautionary tale. Do not think you are above it, he warned. Do not think that it can happen only in another country. We are all, given the right circumstances, just as susceptible to the savagery that lurks beneath the surface of our well-regulated lives. We are all the little boys who smeared their faces with paint and hunted pig instead of tending to the fire on the mountain, the fire whose smoke was their only hope of rescue, the fire whose smoke would allow them to finally get home. as human beings seem to have horrific quality in their DNA. ← What Makes Them Do IT?